With the Two of Swords (R), things are happening now. Trust that you are able to make decisions. Release your fear of involvement now, release your need for everything to be “perfect” and in perfect order all the time – allow yourself to relax. Your affairs may be moving very quickly, so do not let the pace get you down. Give yourself plenty of time to think before committing yourself to anything. Be sure that you are dealing with the right people and until you are absolutely sure – put off making any decisions. Your balance has been lost – you have been knocked over by the people and problems charging your defenses. The blindfold has been removed so that you can see the truth and communicate. This has been an emotionally shattering experience for you – you will need outside help. To divide mentally. Extremes blocking mental resolution and progress. Mental impasse, indecision – the mind may be unclear for one reason or another, including the intrusion of the lower emotions. Argumentative. Problem with investigative process, with definition of alternative, over or under the mark. Overly cautious or overly careless. Looking at the wrong thing. The agreement/ compromise may not be a good one. Being totally for or against the other position. Opinionated, prejudiced, non-objective. Adoption of other view in violation of previous personal beliefs. Prosecution. To disagree or divide mentally – to distort or bring confusion. What are you hesitating to do? With whom do you have to make peace or reconcile? What are you struggling to maintain in balance? What decision would you prefer not to make? What would you prefer not to know about? Next to Moon: Worry will effect your health – do not allow your imagination to make your concerns more than they really are. Get a grip on yourself and think positively! Next to Sun: All is not lost – you will be back in action very soon – hold on to your beliefs! Swords on all sides: Don’t cut yourself off from loved ones, let them help – they will understand. Remember, it is always the darkest just before the dawn! In the first position: Objectivity, mental fairness, open-mindedness may be the contents of your crucible – these have been hard for you in the past. In the second position: May either be bogged down with agreements and conditions and knowing the opposition or you may not be sufficient in these matters. Inability to compromise versus the pitfall of over – compromise. In the third position: Be neither too cautious or careless in the arrangements at hand – there is good reason for another look at the question. There may be neither enough information at hand, nor the correct information. Be thorough in getting all the facts. Do not ignore the input, overtures of others. This is a time to disagree if you have the slightest hesitation. In the fourth position: At one extreme, an envy of the “other” viewpoint, even another entirely different culture; at the other extreme, a bias toward the position of “self” even to the rejection, suppression of another person or culture. Love of one’s own ideas above and to the exclusion of all others. In the fifth position: Either disagreement or over agreement. Mental avoidance. Inability to define choices or if choice is clear, then inability to make a decision. Preference for the status quo, even thought you know it isn’t working. Possibly too bound up with formal agreements or the reverse, need more structure, reliability than now exists. In the sixth position: Effect on the emotions of ignoring mental alternatives. It isn’t uncommon for our consideration of the “other” mentally to be taken as a flirtation, an emotional involvement and be difficult for our personal partners to accommodate. Many men’s preoccupation with sports is a source of aggravation for their mates, as is many women’s preoccupation with talking with their friends aggravating to their mates. In the seventh position: Doubt where unnecessary, unproductive. Fomenting chaos. Criticism for destructive purposes, over-critical. Ignoring alternatives. Beware of bias, self-righteousness, hard-headedness. Fear of new ideas. Mental complacency. 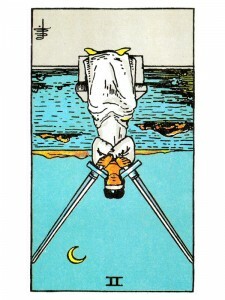 In the eighth position: It is important to review a reversed interpretation for the card in position 10 in order to free the physical plane from the grip of the mind. In the ninth position: At the extreme, on the one hand we see the feeling for the opposition make us leave our base of operation all together – the dilemma of the traitor, the double spy for example. On the other hand is the callous non-feeling for the position of the opposition. In the tenth position: This breakthrough to a new position may be very hard work on both sides, perhaps requiring considerable accommodation by one or both parties, but it will come. Conversely, it could me much easier than anyone might expect, producing surprising results.